The walls of our front entry and stairway were clad in knotty pine when we moved in. We weren’t fans, to say the least. I wrote about priming the wood back in August of 2007, but I realized recently that I neglected to follow up with the finished look. Our baby gates went up this weekend, but I took photos before I installed them. The paint color is Campground by Behr, and the fabric on the door and window was from IKEA, as was the little pink rug. I love the beautiful doorknob on the door to the living room, and I’m pretty fond of the vintage paper punch we use as a doorstop. 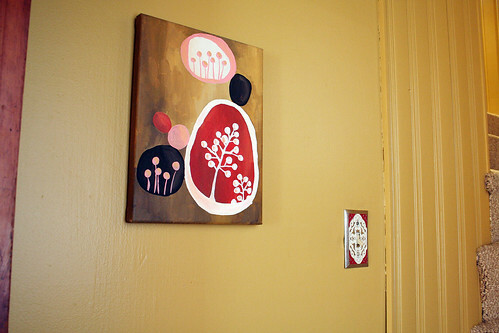 I hung a small painting that I made and put up a cute switchplate from Anthropologie. Above the railing that we installed, I hung four Syroco panels scored on eBay. And here, a lovely shot of just how crowded this little area gets when you actually open the front door. Now imagine a baby gate on the bottom stair that swings out into the space. Nice. Love the paper punch as a doorstop! Looks like it was made for that purpose, clever! Thanks for sharing the staircase, many people forgot about that part of the home. It looks great. You got to love the old hardware. 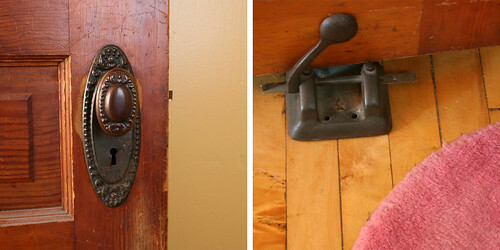 I’ve been collecting pieces here and there over the past few years so when I replace the cheap hollow-core doors with old solid wood ones found at salvage yards, I can give them life with old hardware. You have no idea how badly I want to! Alas, I’m finding it difficult to fit it in so far. Soon though… I hope! The doorstop is a fabulous feature. I love how you worked with the wood instead of fighting against it. Very cute area, a nice welcome to your home. This is so pretty! And well timed too –this weekend’s project is painting our foyer/entryway. I’m curious, did you paint the hallway ceiling the same color as the walls? Yes. I usually paint the ceiling the same color, unless the wall color is very dark (like in the library). i really love how you are always combining red and pink in every space! here w/ the window fabric and floor mat. that doorstop is such a great idea! you know i’ll be on the lookout for something similar! Much better painted! Now it doesn’t look like an old hunting lodge. :-P Also, love the vintage details! 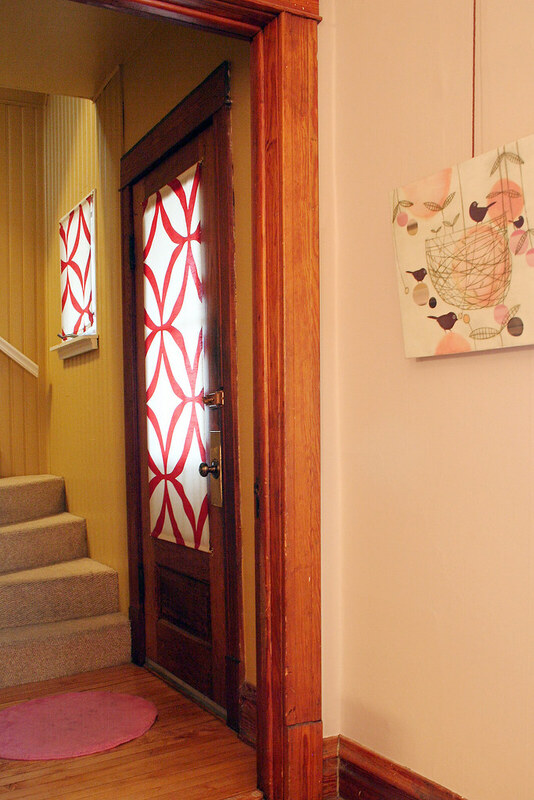 Did you make your door screen/window covering? 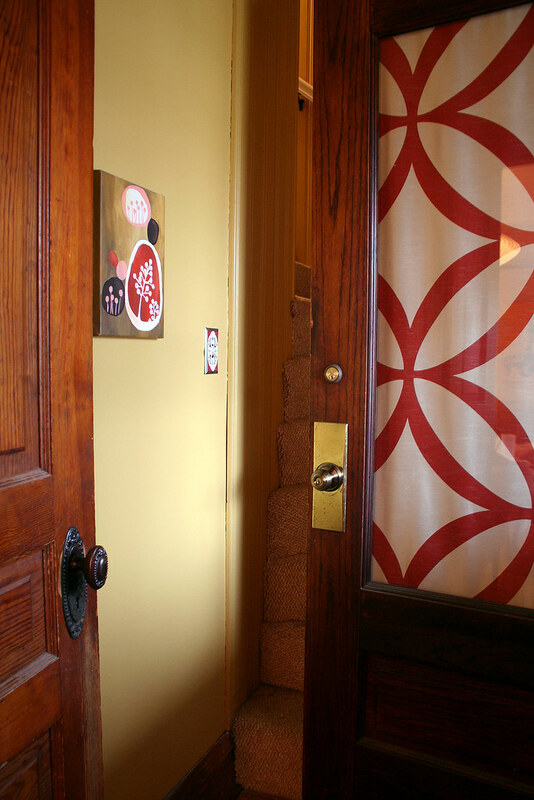 I have a similar door (3/4 lite) on order and will need a similar covering. If you bought it can you share where? If you made it can you share how? The fabric panel from IKEA was the perfect width, so I just hemmed the top and bottom with a pole pocket and hung it on little café curtain rods from Target. Ditto on the door screen. Love it! Is the print on both sides or is there a solid that faces out? I need to make a few of these! The print is sheer and shows up on both sides. About the babygate: I have one that is retractable and I *believe* is rated for the bottom of stairs. It’s been years but I think it came from one step ahead. It’s a total space saver. And nearly unclimbable since it’s mesh (my then 3 year old gave it his best try repeatedly). I have a 1955 ranch and one of the bedrooms is knotty pine walls and ceiling with wood shutter double door closets. I couldn’t take it so I painted it too! Hard, hard work and very time consuming to sand, prim and paint due to the groves but so worth it at the end. I’m still working on it but when it’s done it will be great. Thank you for supporting painting wood!! Wonderful! Cheery yellow! Must make you smile on your way to bed. What Emily said please! I need someting for my kitchen window and door and have no idea what to do, but your idea seems perfect. Please share how you made your coverings! I hung the panels with café curtain rods, similar to these (which are lovely, but I picked mine up at Target for much less). Wow, thanks so much for posting this! We just bought our first house 6 months ago and the lower half of our bedroom and my studio is knotty pine. I hate it and have wanted to paint it, but everyone acts like I am a crazy person when I talk about it! I’m so glad to see yours came out so well and am now off to make my own painting plans! What a huge difference – looks fab! Oh that is a lovely change, congrats! Oh, ours are nothing beautiful. Function over form in this case. We bought this one. That color looks great with the wood on the doors – what’s the color name? My kitchen has knotty pine cabinets and I like them, but the wall below has this strange wallboard with brick faces on it – it looks like a brick wall but the bricks are about 1/4″ thick. I think it would be a hassle to remove the brickboard from the plaster behind it, so I’d like to paint it in a color that will go well with the cabinets. They are the traditional aged knotty pine color, clear lacquer over amber varnish. Hi, I’m curious about the painting in the 2nd pic. Is that an etsy find? Great colors! I love that doorstop. First I am going to finish up what I have started and take photos. I still have a lot of work today. I know once I get the bathroom done, I will be the happiest girl! Love the color on the walls. It looks great! I used a tool for painting baseboard against carpet. I don’t know what it’s called, but I picked it up at the paint store. It’s just a slightly curved (to hold the carpet back away from the wall) metal shield kind of thing with a handle. 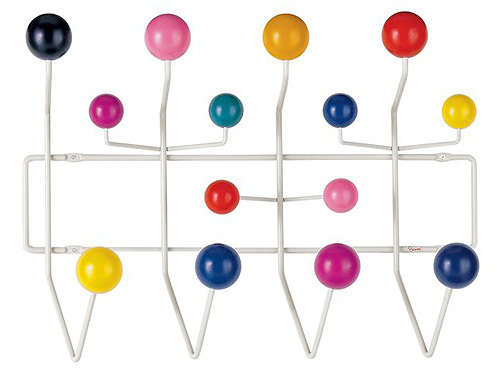 Wow, this makes your staircase much more fresh and lively! You home is beautiful. Little Eleanor has lots of eye candy surrounding her. Ah, I adore those dark panels against that buttery color. Beautiful! 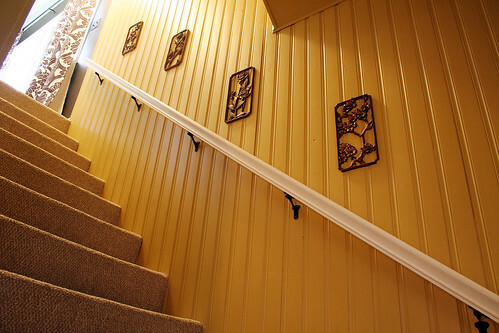 OK – I’m usually not a fan of yellow in any part of a house, but it TOTALLY works there and looks great! We have a ceiling like that in the bedroom of our house. It is awful and I want to paint over it so badly but my boyfriend thinks that the knots in the wood will bleed through. Did you use a special primer or paint to cover up the wood? This hallway looks great and I think I can show this to my boyfriend to prove that painting over the wood isn’t a bad thing! Zinsser primer to the rescue! One coat of primer plus two coats of paint, and none of the knots have bled through. I don’t know how you do it…you make every nook and cranny of your house cute! What a transformation! Not only does it brighten up the stairway, but really opens up the space by beautifully reflecting the light. Great color choice, especially next to the bright Ikea textile! Looks so good! I love the color and love the hole punch. It lloks exactly like the ones that were used in pharmacies. Many pharmacies used a two hole punch on the side of the prescription and then file the script on a wire rack. I have had my eyes on the lookout for one of those. Great repurposing! So many fun details. I love it! I like the idea using the fabric. This could be something for us (especially for a shelf), too. Wow. What a difference paint makes. Even if you had solely done that, it still would’ve been a major difference. I also like when people salvage outdated stuff and make it new. Some people would have considered ripping that paneling out. Now your walls are pretty and have texture. Double bonus! 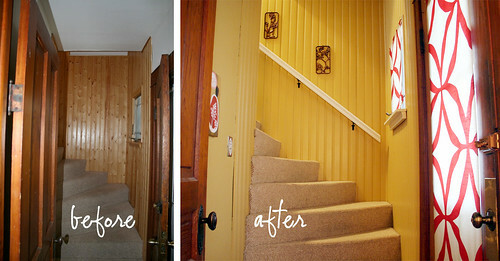 Love your entryway…glad you painted the knotty pine…looks so much better! Oh, and I love your creativity too. gorgeous! any chance you’ll come style my house too? oh it’s only about a thousand times better! the yellow color alone makes everything so much more cheery and bright. sure wish i had your eye for home design. I love the bird/nest canvas you have on the wall in your living room and would love to know where you got it from? Like another person commented, was it an etsy find? Its just what I have been after!! That’s an encaustic (wax) painting by Amy Ruppel. Very well done! And the doorstop is brilliant – kudos! great job – the doorstop is brilliant – kudos!!!! I absolutely love your transformation. I did a little “Spotlight On” piece for my blog with it featured. I love the fabric on the door and window from IKEA. It’s so fresh and fun! I’ve never hung cafe rods before…do you screw them right into your door? We rent, so that really isn’t an option…any other ideas? lovely fabric in the window…the whole entryway is great!